Keywords are single words or phrases that are used to target user search queries on search engines like Bing. When a customer’s search query matches your keyword, this triggers your ads to display. Choosing keywords is one of the most important aspects of creating and maintaining a successful pay-per-click (PPC) advertising campaign. But where to start? How do you identify the many possible keywords that describe your business? How much should you bid on those keywords to be competitive with other advertisers? The importance of brainstorming, how to do keyword research and how to choose keywords following best practices. How to incorporate the concept of match types and negative keywords into your PPC ads. How to use Bing Ads Keyword Planner to research and find keywords . Why do consumers need your products and services? Why would a consumer choose you over your competitors? What types of questions might a consumer ask to find your products and services? The end result of this brainstorming exercise should be a seed keyword list. These seed keywords will help you plug into actual tools to take your keyword research to the next level. There are a wide variety of tools at your disposal for research and optimization of your keyword lists. One of these tools is located directly within Bing Ads. On the top menu, click Tools and then click Keyword Planner. Click Search for new keywords using a phrase, website, or category. Learn more about how to use the Keyword Planner tool. 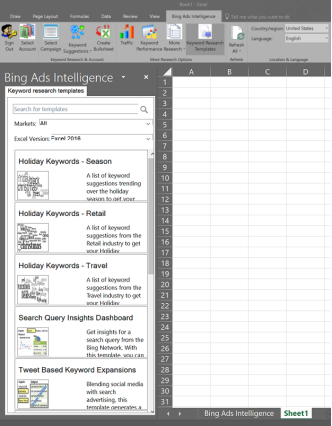 Another powerful tool for working with keywords is Bing Ads Intelligence – an extension for Excel. This tool seamlessly operates in Microsoft Office Excel 2016, 2013, 2010 and 2007 and provides many features and templates for researching or expanding your keyword lists. Learn more about Bing Ads Intelligence. As you build your keyword list, you will find keyword variations that are a perfect match – and some that are close, but not perfect. How do you deal with those keywords that are only “close” to perfect? Match types. 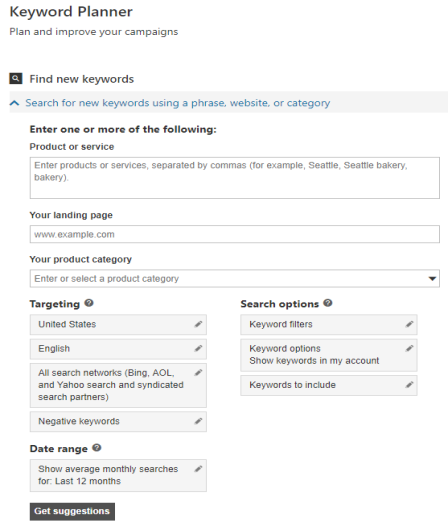 You control how Bing Ads matches your keyword to user search queries. Exact Match: end user must type your keyword into the search box – word for word. Phrase Match: end user must type your keyword into the search box, but additional words may be included before or after. Broad Match: end user’s search query must be close to your keyword and may contain synonyms, slang or similar words. If you find there are keywords that are not relevant to your business at all, you have the option to exclude those words. Negative keywords allow you to define exceptions to when your ad will be triggered. For instance, if your ad sells shoes and you’ve specified “tennis shoes” as a keyword, you can prevent your ad from being displayed in response to a search on “tennis courts” by adding “courts” as a negative keyword. Learn more about match types and negative keywords. On occasion, you may upload a new keyword just to find that it has been rejected, or disapproved. Keywords that do not meet Bing Ads editorial policies are given a disapproved status. You will be alerted to any issues with your keywords in the Delivery column of your keywords list, as well as by an email notification, at which time you can either fix the issue or request an exception. Learn more about Bing Ads policies. Your knowledge of your business is the best place to start for keyword brainstorming and research. Use Bing Ads Keyword Planner and Bing Ads Intelligence tools to research and expand your keyword lists. Take advantage of match types to control how your keywords are matched to user search queries. Thanks for reading this training on how to do keyword research and finding keywords that are relevant to your products and services. Continue your training or take the Bing Ads Accredited Professional exam to become accredited.